Wednesday May 15 1907 It was a showery unpleasant day. The boys doing some work about. Billy fixed the chicken house windows for me. I got some hens for Mother tonight I am still very hoarse. Will went to town and got medicine for me. Preston [Kover?] was married at 7.30 this evening to Miss Cora Myers near North Liberty. Thursday May 16 1907 I slept well last night and think I am feeling some better. I am very hoarse but my throat not so sore. Will finished planting the corn on our farm today. "Lady" has a nice little mule colt. Ralph is at work at the painting. Weather some pleasanter. Friday May 17 1907 It was such a pleasant day. I was out around the yard a good deal. Will busy about the place all forenoon and to town in the buggy in afternoon. I sewed some. 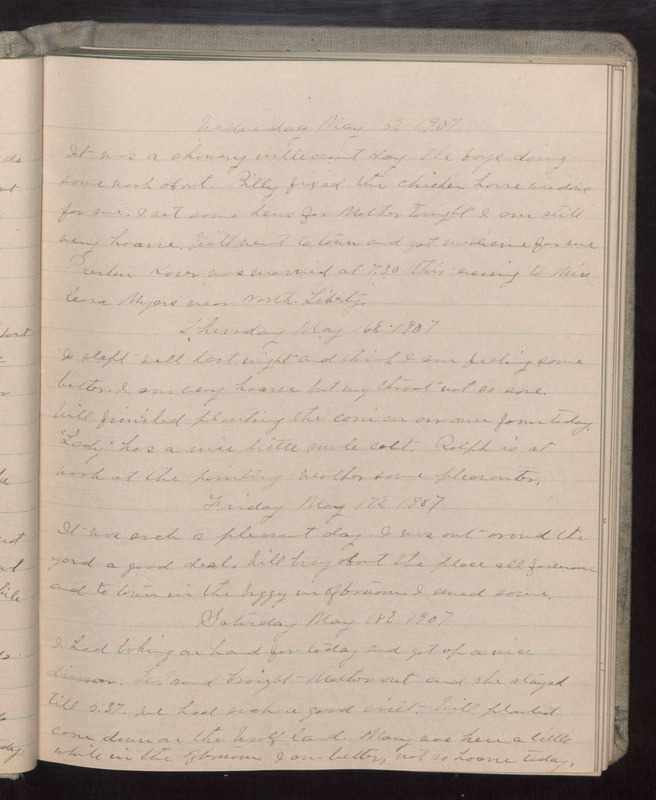 Saturday May 18 1907 I had baking on hand for today and got up a nice dinner. LeGrand brought Mother out and she stayed till 5.37. We had such a good visit. Will planted corn down on the Woolf land. Mary was here a little while in the afternoon. I am better, not so hoarse today.